Over the past few weeks, you've probably noticed FlipKey inquiries being sent to you as "Unrecognized email" from OwnerRez. The parsing/discovery code in our system has been updated and those emails are now, once again, being inserted as proper inquiries into OwnerRez. What about the guest contact info? 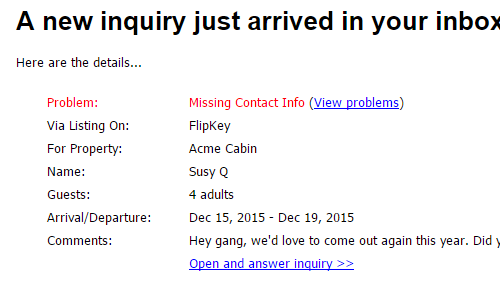 For many users, FlipKey no longer shares the guest contact info (email address and phone number) anymore. That information is completely locked down behind your FlipKey login. When that occurs, a "MISSING CONTACT INFO" status will appear on the inquiry with resolution options for you to login and copy the guest info out of FlipKey. We've made the process as fast as possible where you can click a single button to open the inquiry on the FlipKey website directly and copy the guest info back to the OwnerRez inquiry. We are expanding inquiries in the near future and developing a method to retrieve all information from the walled-garden listing sites (FlipKey, Airbnb, etc.). To that end, we have laid the groundwork for inquiries that have partial information, malformed information, rule violations, etc. so that you have a clearer understanding of the status of the inquiry and the steps you need to take to resolve it and respond. You will notice that there is now a Status column on the Inquiries grid and a new Resolution section on the overview page of the inquiry. The Status of the inquiry changes as activity occurs throughout the system. The Resolution section will always show action buttons relevant to the current status.